On this day in 1904, a strip debuted by the name of Foolish Fred. It wasn't successful, lasting only a few months, and is pretty unremarkable even for strips of the time. 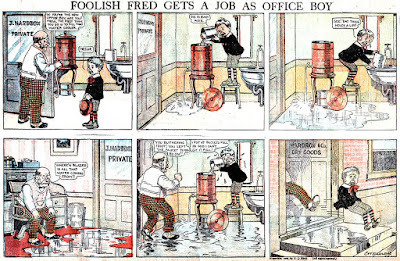 In any event, you can see from the example above the concept of Foolish Fred isn't that interesting or original. It's not really bad, but just a fairly standard gag strip with little characterization to interact with or appreciate. I will say, though, that I am impressed with the execution of the brickwork in the final panel above, which is rendered only through color and without any linework to "hold" the individual bricks. Very nice and effective use of the medium, but hardly enough to save an otherwise mediocre effort.